Sekhar Kammula has become one of my favourite directors, always entertaining me with interesting observations and a satisfying story. In Godavari he deposits his characters and their relationship issues on a boat, adding a philosophical dog, a sideplot or two and some beautiful scenery to leaven the mix. I’m not totally convinced by all of the elements but I do really like this film. This song sets up the main characters, and acts as the now familiar promotion clip for Andhra Pradesh. Kamalinee Mukherjee is Seetha, a would-be fashion designer. She has nightmares about losing her independence and her close relationship with her parents after she marries. I liked Seetha’s spirit, and I really felt for her coming off a rejection from a groom her parents pressured her into accepting. That had to sting. Seetha is vain and bratty at times but she is funny, insecure and compassionate as well, and admits fault when she is wrong. Sumanth is Sriram, an unassuming guy who wants to get into politics and make the world better. He reveals a manipulative side as he cons his way into appointments with party officials. Perhaps he is a precursor to Arjun Prasad from Leader? He isn’t as effective in his personal life however. Ram is inarticulate when he should speak up, and doesn’t really see things for how they are – he is lost in a vision of how it should be. Raji (Neetu Chandra) is spoilt, silly, self centred and yet not totally unlikeable. Raji judges a relationship by the trappings of Valentines’ cards, fancy coffee shops and all the showy things, things that just never occur to Ram, and she uses this as an excuse to push him away. Her parents know Ram wants to marry her but refuse as his simply isn’t the best offer and they are quite honest with him about this. Perhaps they know their daughter better. Ravi (Kamal Kamaraju) is a cashed up bully, making the most of his status in the IPS. He seems to have some notions of manners and decency underneath all the arrogance, but has done a marvellous job of burying his better side. I can’t say I liked him at all, but I did end up thinking he could be a good match for Raji if he got over himself a little. All the characters are flawed, but not in a dramatically damaged way. They’re just a bunch of people who have good and bad points, and for the most part are quite unremarkable. I found them easy to relate to, even the unpleasant ones, as they were well rounded and I could imagine them having lives outside of the film setting. The boat setting appealed to me for a number of reasons. Not only did it provide a great device for containing the characters and their interactions, it looked great. It had all sorts of strange little additions,extensions and even a tower of sorts. I thought it looked delightfully like something out of a Miyazaki film. Whoever did the set dressing did a fantastic job too. All the powers were invoked to keep the boat safe and sound. 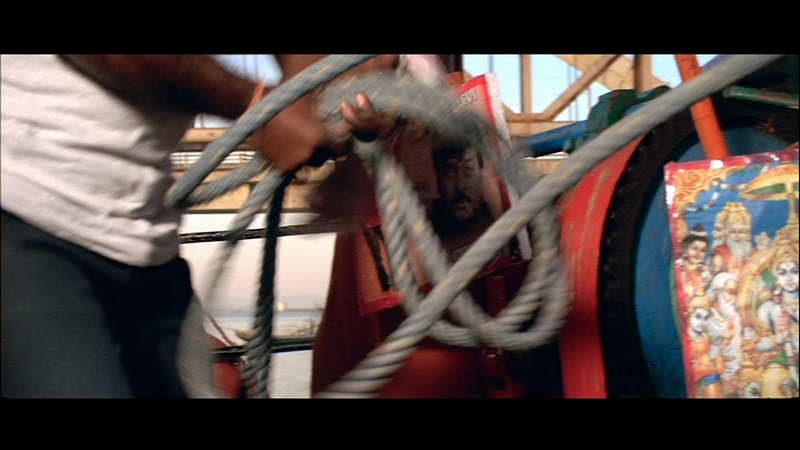 The boat trip also allowed the supporting characters to have things to do other than hang around Ram and Seetha.There was a nice sense of energy as the ever reliable Tanikella Bharani (the captain) and others bustled around. I enjoyed their presence all the more as they contributed to the background life and colour of the film. Seetha’s parents and sister had their own stuff going on at home, and there was a real lived-in feel to their domestic scenes as well. The nominal villains Raji and Ravi had their own issues to deal with, and even in their smaller roles showed some growth. It wouldn’t be a boat story without stowaways. Chinna is a poor kid who pursues a mystery man (OK, it was Ravi) who does him out of the balloons he sells. 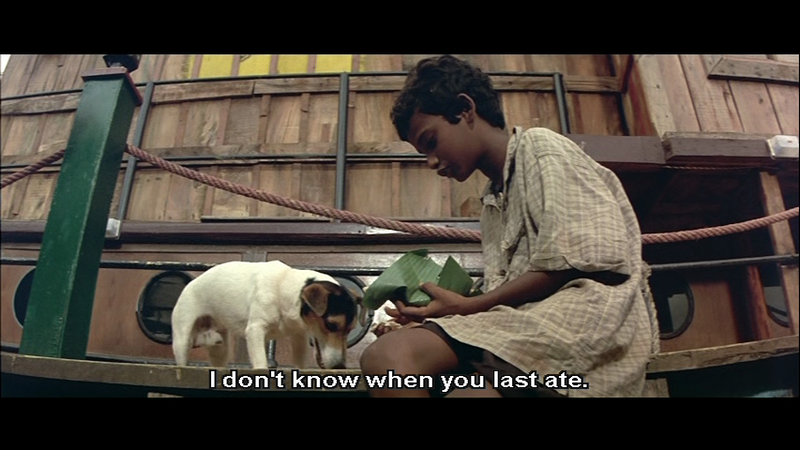 Koti, a dog, decides for his own reasons to get out of town. When Koti sees Chinna pay his bribe, he has a flashback to Daana Veera Suura Karna and swears fealty to his new master. They team up and give us their points of view but also provide the catalyst for people to reveal their own character – are they charitable, curious, mean or oblivious to the boy and dog? 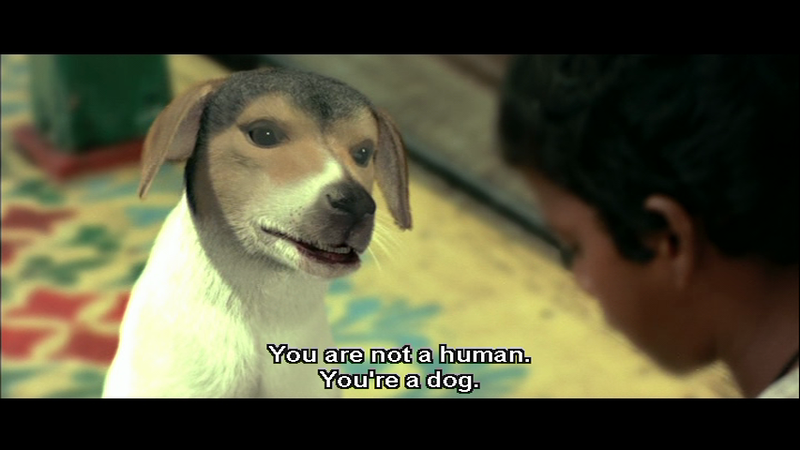 While I liked the idea of Koti and the voiceover (by Sekhar Kammula, and what a world weary creature with a 3am whiskey voice he sounded), I did not like the CGI dog. The real dog had ample charm and verve and I don’t see the animation was necessary. I kept hoping it wasn’t because the real dog became, er, unavailable after a boating mishap. For those of you who demand pirates, there was a fairly silly episode involving a fugitive and a night ambush but it only served to show that Ram is reliable and Ravi isn’t so I will move on. There is no surprise in the romantic pairing of our waterborne humans as their journey to Bhadrachalam follows that of Ram and Sita. Our Ram and Seetha are attracted to each other but there are obstacles, both real and imagined. I really enjoyed their conversations and the way both Sumanth and Kamalini showed the growing intimacy and comfort they felt in each other’s company as well as the pressure of the potential relationship. They did daft things, sure, but there was no sense of them being stupid or unpleasant people. Kammula uses a lot of voiceover monologues, and both actors did a good job of mirroring the inner voice with their expressions, ranging from funny to heartfelt. Sometimes I find a voiceover can leave me at a distance, but in this case it worked well enough and suited the introspective nature of the characters. I don’t like the background score at all. It is too cheesy, and seemed to try too hard to be whimsical. But the actual songs are more attuned to the mood of the scenes, and subtitled, so I could at least appreciate a fraction of Veturi’s lyrics as well as K.M Radha Krishnan’s melodies and the beautiful scenery. There is little dancing in the film, and it wouldn’t have been appropriate to much of the story; but if I have a criticism of Sekhar Kammula it is his over use of the montage. Then I saw Sumanth dance and I thought well, yeah, montages have their place— but there has to be a limit. The lyrics draw attention to the beauty of the river and the power of unseen forces in our lives. The river is a metaphor for the forces in life that nudge us hither and thither, and the power of chance meeting and parting. But this Ram and Seetha also show that you can fight the current when you want to and make your own way. Finally, I give Godavari 3 and ½ stars. For those who think 3 and ½ is just plucked from the air , it goes like this – Points on for the convincing performances, points off for the animated animals, points back on for the real dog, more points on for a parrot asserting her independence, some points off for too many montages, and finally points on for the film being so pretty. Watch it for the beautiful balance of observational style with a fresh twist on the filmi clichés. Heather says: I really like the way that instead of road movies, the Telugu film industry has river films which surely do a great job for the tourist industry. 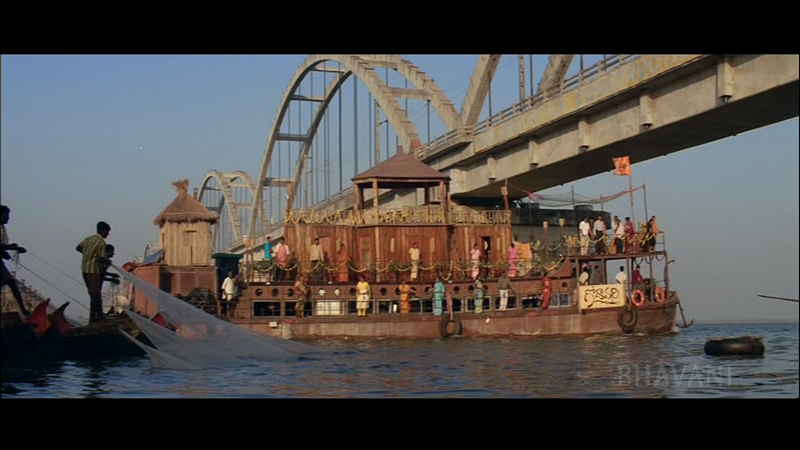 The river looks beautiful here and the Godavari boat is fantastic. I love the way it’s at least 3 boats joined together, one of which has fantastic wooden panels and just to add a little more space it’s also towing a raft behind. It looks like a great way to travel from Rajamunday to Bhadrachalam, although I suspect in reality it would be rather wet and cold. I do appreciate the way that in time-honoured fashion everyone jumped underneath big blue plastic tarpaulins when the rain started. I remember those well from travelling on the top of buses in India and Nepal! The story of the romance between Ram and Seetha, both rejected by their prospective partners, is different enough from the usual to be interesting and I like the way that Ram had to deal with being in such close proximity to Raji and her fiancé Ravi for the duration of the boat trip. Kamalinee Mukherjee’s Seetha is beautiful and chirpy and I really liked her character from the beginning. Even her obsession with her beauty is funny rather than irritating and I feel that she stayed true to her independent nature throughout the story. Although Ram is initially a very pedestrian character with his idealistic ways and mooning over Raji, he becomes more likeable in his interactions with Seetha and the young balloon seller Chinna. Ram and Seetha’s gradual attraction as they argue is realistically handled and I think both Sumanth and Kamalinee Mukherjee are well cast in their roles here. The cook Pullamma is a great character and her indignation when she thinks Ram has given her brother money because he feels sorry for him is one of my favourite scenes. I like the way Sekhar Kammula’s points out that poor people have pride and dignity very well, particularly since there is so much emphasis in the story about altruistic behaviour being the ideal to aim for. As well as another reason to dislike Ravi (and I’m not sure we needed quite so many), Chinna’s character adds some funny comedy. The CGI talking dog is strange and I agree with Temple that it wasn’t necessary. The talking dog idea was fine and the voice-overs were quite funny and used well but I think this could all have been done with the real dog, rather than introducing the CGI. But it wasn’t too much of a distraction and the story of Chinna and Koti is well written into the main story. The characters of Raji and Ravi are also more than just part of the backstory and I appreciate the way that all of the supporting cast are used to further develop the romance between Seetha and Ram, either by helping them or by adding more obstacles to their path. There are a few things that confuse me. I’m not sure why the fortune-teller decides to jump into the river. I can’t work out if he’s just chasing his parrot or if his declaration to Rama is more significant. The fight scene also seems totally unnecessary and the whole storyline of Veeraiah didn’t add anything other than a chance for Ram to be a hero. There is so much to enjoy in this film. the boat setting, the lead actors, the story and the support characters are all excellent. I love the songs as well, especially Tippalu Tappalu in the rain, and the shots of the river are beautiful. Godavari is a really entertaining film and I give it 4 stars. This entry was posted in Tollywood and tagged Godavari, K.M Radha Krishnan, Kamal Kamaraju, Kamalinee Mukherjee, Kamalini Mukherjee, Neetu Chandra, Sekhar Kammula, Sumanth, Tanikella Bharani, Telugu, Tollywood, Veturi. Bookmark the permalink. You girls are too fast for me. 🙂 I am just on my way to the library to pick up a dvd of Eklavya (I had to request it from another branch), which I thought I’d watch before continuing my comments on Madraspattnam, and here you have put up a review of another film that I watched partially and meant to get back to one of these days. So I guess I’ll have to hop onto that quick! The comparison of the boat to a Miyazake creation was awesome! I need to rewatch this one, I think I was distracted when I watched it the first time and some of its subtleties were lost on me. 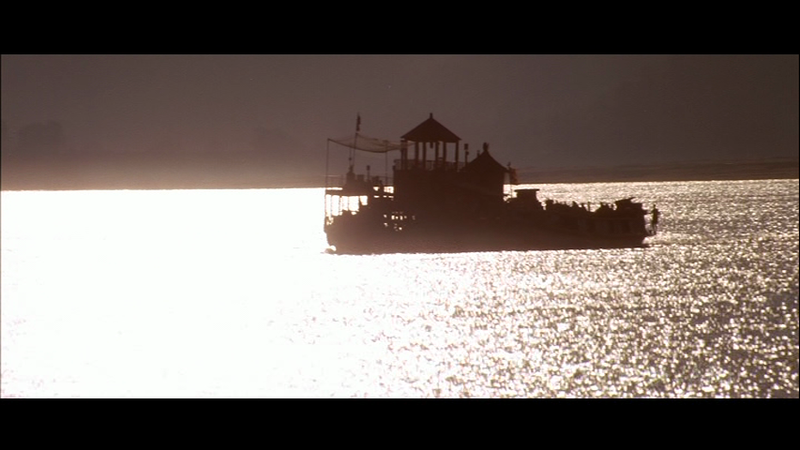 While I slightly prefer Gopi Gopika Godavari in the “Kamalinee on a boat” genre, I think Godavari did a better job of glamorizing river travel. It took me ages to watch all of this film – I watched the first 20 minutes or so at least 3 times before finally getting past the rather slow introduction. Once I got to the river journey though I was totally hooked, and wondered why it had taken me so long to get round to seeing the whole thing. Well worth it! I watched it ‘socially’ with a crowd of people and tea, snacks and conversation so got distracted every now and again. Your review reminds me that I should get it and see it with more concentration this time.. I love this movie and watch it again. Or at least parts of it when I am feeling down (with thunderstorms for all weekend). I think in this movie Sumanth is just perfect. He is delicious to look at and as always plays himself :). Although it is primarily a romantic movie, I thought the characters were also refreshing regarding their line of work and the amount of effort they put in to build their unusual (for the middle-class) professions. Yet another film, the number of times I have watched is in double digits. I like this movie for its brilliant songs, montages and obviously Kamalini. She is the life of this movie with her effervescence. Sumanth is good in his role but this is not his movie. And I wouldn’t agree with the idea that Sri Ram possibly being a precursor to Arjun Prasad. Sri Ram is more of an idealist – a dreamer. Arjun Prasad is more of a realist. Arjun is not above bribing to get his way but Sri Ram is far too principled for that – him refusing to disclose his caste to the Party secretary being a good example. And him disclosing that he has an appointment with the ruling party was not one of shrewdness, but more of his naivete. On an completely unconnected note I could notice a lot of parallels between Rana Daggubatti’s Arjun Prasad and Ranbir Kapoor’s Samar Pratap in Raajneeti.